I set big overarching goals (eg. write a book, reach more women, increase passive income, support a cause important to me) based on these missions. I map out the tasks that need to be completed to bring these goals to life (eg. grow my email list, understand a specific need of my target market, create passive income earning products, get coaching on writing a book). I break each task down into small actions (eg. posting on instagram, sending email newsletters, writing blog posts, researching book writing courses) and these actions go into my calendar - some go in once, some daily, some weekly, some monthly, some at less regular intervals. Things don’t go always according to this schedule of course but usually they do - which means I stay on track and feeling good and purposeful about the work I’m doing. Truth be told, I used to find the planning process really difficult and overwhelming (it’s definitely still challenging!) because it forces me to slow down and really consider every action I’m taking in my business. It’s easier to gloss over things like working out your target market or core message and jump straight into the doing and creating (the fun stuff!) but having a deep understanding of what you're selling, why you're selling it, and who you're selling to are the foundation of a business - and mine didn’t become successful until I put the time aside to carefully build a strong foundation. One of the biggest errors in judgment I made when I started my business was thinking I could figure it out on my own from the get-go, when I had no experience planning for or running a business. I was reading the books, doing the courses, listening to the podcasts but instead of feeling clear and inspired, I felt scattered and overwhelmed and more stuck than ever. 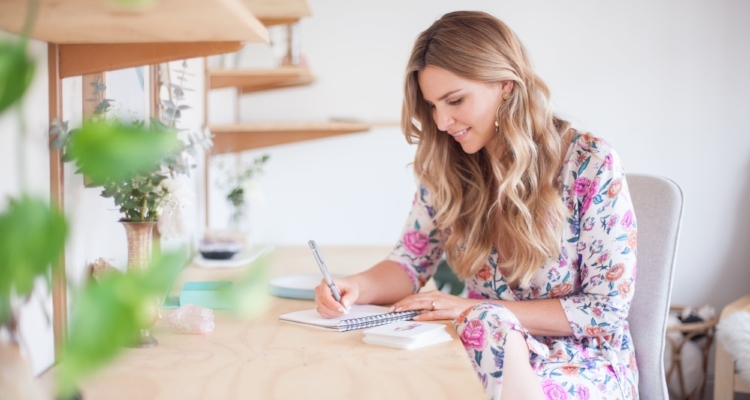 I had no idea which strategies were right for me and my business or how to implement them...so I signed for for 1:1 business coaching which turned out to be the missing piece of the puzzle that helped me take my biz from a hobby/side hustle to a growing and thriving business that allows me to work for myself full time. Now I offer business coaching for new coaches and online business owners because I'm so passionate about helping people bring their heart-lead businesses to life - without the uphill battle! While the planning process involves lots of thinking and strategising, it's so important to let your intuition be part of the process. For your mission and goals, ask yourself - does this feel right to me? Take the focus off what other people are doing and choose your own way based on what feels great to you. Make sure you're aligned with the energy of success and abundance that you want your business to have - my favourite way to do this is with meditation and you can download my Manifesting Abundance meditation for free here. Working for yourself definitely comes with it's own unique challenges, the biggest is that your work can take over your life! Use this planner to create great boundaries around your work and leave time for self care and other interests (because even when you love what you do, it's exhausting to do it 24/7!). Questions about starting your new biz or growing your side hustle? Ask away in the comments!